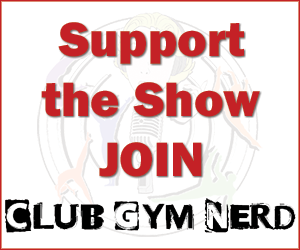 This week’s episode is proudly presented by new Club Gym Nerd member, Saul, who joined at the Episode Dedication level. Saul dedicated this episode to Natalia Frolova’s 1986 floor routine. This Soviet great does one of his favorite old school routines; he watches it from time-to-time and not enough people know about her amazingness! We couldn’t agree more. Thank you for supporting the show and spending the Frolova, Saul! The insanity of Aly Raisman scoring higher than Jordan Chiles on vault. Best moments from the NBC broadcast. Yes, we said best, as in we liked some things. Giulia Steingruber has improved her performance quality so much, but her head position on vault is still scary. Aliya Mustafina’s controversial non-acro series on beam, and the Russian team dominated. Ponor’s comeback was glorious and why she should have place higher on beam. Why Lauren is obsessed with the Czech juniors, like Vendula Měrková doing an Onodi to an Illusion at Bohemians Club. Danell Leyva’s second round of dog bites, stolen medals and new towel. Marvin Kimble’s celebration for the history books. Paul Ruggeri – a 16.000 on high bar and finishing in the top 3 on 3 events! Olympic Team Strategy: We are with Spencer, screw pommel horse and maximize the other events! Actually, Mustafina submitted an inquiry on beam during the team final but I never found out whether it was accepted or not or what it was for etc. Do you know anything on that? Also, Steingruber’s floor was gorgeous during finals. The flight she gets on those leaps, amazing! So very happy for Giulia to get that moment in front of her home crowd! I’ve wondered if some of the European teams envy the US for always getting to perform in front of large crowds of screaming fans, because our fans are super passionate and supportive, but the Bern atmosphere was great. Much better than Sofia in 2014. I think the enquiry was for the switch ring, it gets downgraded from E to D sometimes. It wasn’t accepted. Despite all the hate being throw at Aly I\’m still rooting for her. I would love to see Simone and Laurie in the AA in Rio – but Aly has a lot to contribute and it would be nice to hear more about her that isn\’t negative. I couldn’t agree more with the medals talk, I think it works for Russia wag too. I love Melnikova but 57 would hardly medal at AA, they might be better off counting with 1 event specialists that are real medal contenders like Spiridonova and Paseka. I couldn\’t agree more with the medals talk, I think it works well for Russian WAG too. I love Melnikova but 57 would hardly medal on AA and Russia should be better off counting 1 event specialists that are real medal contenders like Spiridonova and Paseka. I used to really enjoy this show, but wow. I\’m not sure when you guys developed such a problem with being able to treat athletes fairly, as opposed to whether they\’re from one of your preferred gymnastics countries or in some cases whether or not they\’ve been on the show before. You can argue whether Aliya does FWO or FHS when relevant. But attempting to trash her beam final routine, which was well connected and deserving of the great score it got, is wrong and frankly very biased of you. As was pointed out to you on twitter, you had ZERO issue with aerial-based acro series when the Dutch did them. In fact, you were full of praise for their approach to beam in working with the code to construct something that worked for them. When Aliya does it (and connects them) it\’s suddenly a problem for you? As was also pointed out to you on twitter (glad Irishdaniel called you out), when Simone hits a great floor routine and wins a world title, you don\’t IMMEDIATELY turn around and start criticizing her for using a front aerial to fulfill the forward tumbling requirement, even though nearly everyone agrees that\’s a cheap workaround that is thankfully being taken out next quad. Really disappointed in the double standards and this show\’s inability to treat gymnasts fairly, and people will continue to call you out on it. Many thanks to Jessica, Lauren, Spanny, Spencer and all the awesome regulars and guests for bringing this highly entertaining podcast week after week! The chance to praise, pick-apart, laugh and cry about the fantastic elite gymnastics world is something that I look forward to every Wednesday. Please know you have a dedicated group of listeners out here and we love you and appreciate the time you devote to making this podcast happen! TALK AS LONG AS YOU WANT. Love this show…and very much loving the Douglas Family Gold recaps! Proud member of Club Gym Nerd!!! The one thing that caught my attention with US Classics was Ragan Smith’s beam routine. The judges thought her knee scraped the floor, If she cleaned her landing, her score would have tied Simone for the top beam score. That’s pretty dope. Also I’m curious about the Russian training. I wish there was videos of the girls yelling back at the coaches, I would love to see that. haha. But question is, did the girls used to do that back in the day? Did Gutsu, Bogi, Lyssenko, etc yell back at coaches, or is it a millennial thang? Love the episode and all the commentary! I have to say that I disagree with the fact that Maddie may get the nod over Ashton because of the fact that she can do AA. Marta is DEFINITELY bringing four strong all around gymnasts that would all get the nod to do the V, BB, and FX (unless Kocian or Locklear end up being one of the top beamers, not likely); which is a shame because I do enjoy Madison\’s FX. 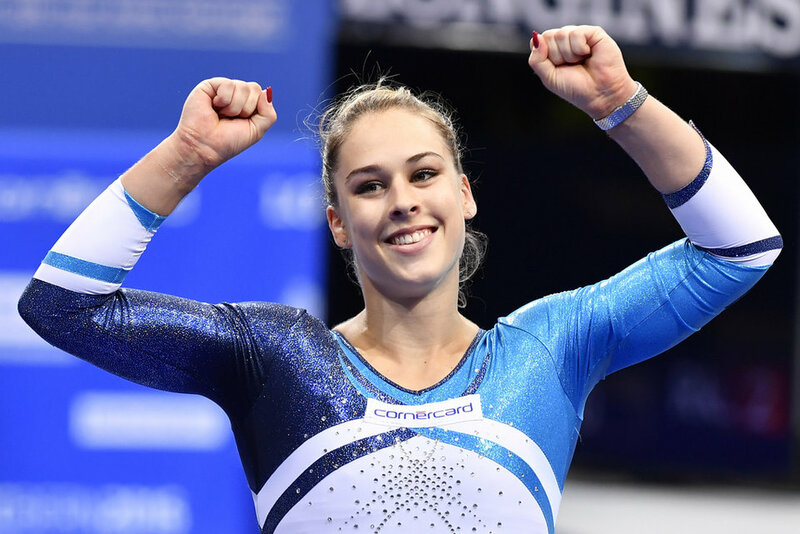 Even if one of the AA gymnasts (Simone/Gabby/Laurie/Aly/Maggie/Ragan, whoever) were injured, I don\’t think Maddie/Ashton would be asked to compete in Team Finals. Marta has so many top AA gymnasts to choose from that she could put up the #4 gymnast on the event OR potentially replace her with the alternate (even though Marta hardly ever does that). I just don\’t see the purpose of bringing five AA gymnasts when only three will compete in team finals any way. Even if Simone/Gabby/Aly/Laurie/Maggie were injured– it would make sense (unless its bars) to put up the #4 gymnast on the team OR replace them with the alternate. Just a thought! Aliya on Beam: Even if she had been deducted .5 for lack of series in qualifications. She would’ve still qualified for event finals. Also she nailed her series in EF. I thought the Gold was well deserved. No one can match her skill execution. Splits, toe point, extension on every skill is perfection. The commentators complaint about Aliya taking bronze in 2014 even without a series. Wasn’t she deducted .5 for lack of a series, but still took bronze? OMG, the intro to this episode could be a literal word for word replay of what played out in my mind after Men’s Nationals. SERIOUSLY, if Paul is not on this team, my heart will harden, turn black, then burst into a pile of dust. I won’t be able to handle it. I’m rooting for him more than any other athlete EVER. Come on Gym Gods!!! On letting the men focus on individual vs the team medal: first with how the US men’s team is currently ranking I think it would be better to focus on the individual medals. But to counter the argument that the US in general puts too much focus on the team I think winning a team medal can show more depth to your program and therefpre be more prestigious. Apologies for the lateness on this — I no longer have internet at home, and am behind on listening to these episodes! Just wanted to comment on Giulia Steingruber\’s DTY at Euros. She nailed the vault in qualifications. It was absolutely beautiful. She attacked the approach. Blocked high. Stuck it cold. Except for some crossed feet in the flight phase, it seemed perfect (well, it seemed perfect to me, at least!) In comparison, her DTY in EF was markedly slow and labored. From the moment she started her run, you could tell she was holding back. And not just a little bit. I would not be surprised if she were flashing back to Glasgow as she approached the table. From my perspective, the scariness resulted from a failure to fully commit to the vault, and not because she does not have a handle on how to do a good DTY technically. Considering the mastery she showed in qualifications, there is no reason she should have struggled as much as she did with the vault in EF (same goes for what happened in Glasgow, but she seemed to get lost in her twisting there). I am just glad she did not crash and injure herself again. And I hope she can get her head wrapped around her mental block with his vault in event finals, so she can perform her best in Rio, because she has the goods to nail it there.